Achieving fame as probably the world’s biggest-selling premium 4×12 speaker, the Celestion G12T-75 is remarkably versatile, maintaining clarity and control even at thunderously high volume levels. Lows are big and punchy, with plenty of definition without being overly tight. The highs come across with a balanced delivery that lends itself equally to the sweet rudeness of blues or the laser-like focus of shred. 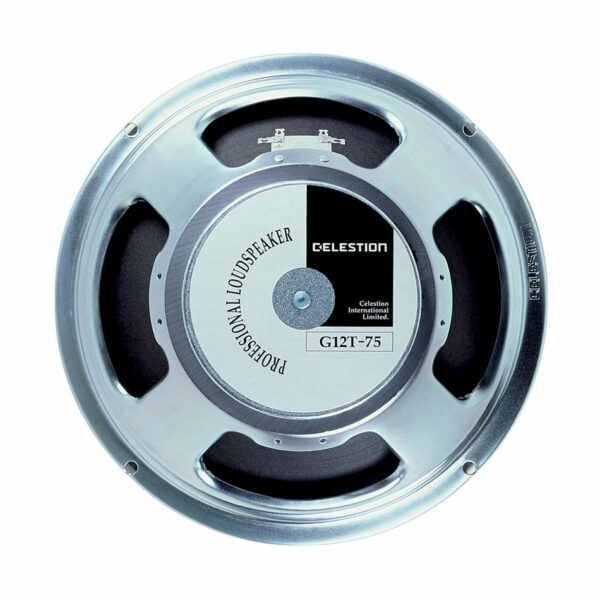 Described by some as a “Greenback on steroids”, the Celestion G12T-75 (also known affectionately by many as simply the T75) was originally produced as a hot-rodded G12M for the high gain amps of the 1980s. It was created to deliver a great rock & roll bite with a firm bass, and a top end that is precise and controlled but never too “polite”. Achieving fame as probably the world’s biggest-selling premium 4×12 speaker, the Celestion G12T-75 is remarkably versatile maintaining clarity and control even at thunderously high volume levels. Lows are big and punchy, with plenty of definition without being overly tight. The highs come across with a balanced delivery that lends itself equally to the sweet rudeness of blues or the laser-like focus of shred. Every cabinet type in our impulse response library is available to purchase as an individual IR pack. Cabs can be purchased singly, or as an entire speaker collection in one package.